Graphic based on ImageRenderer which displays a frame animation from a texture sheet. The texture sheets used by this class contain a vertical strip of equally sized frames, with the top frame being the first frame. These frames are displayed in sequence, with a specified delay (frameDelay) between frames. This class is used for various animations in the game, including the Orb collectables, and the Portal animations. Emitted when the last frame ends, or the animation has just looped. Computes the size to treat the source Texture, for purposes of computing destination rectangle size. The actual texture size is passed in as textureSize. The desired texture size should be written back to textureSize. This can be used in conjunction with computeSourceTextureRect() to select a subrectangle of the source texture for rendering. The default implementation leaves textureSize unmodified. Computes the subrectangle within the source Texture to render. textureSubRect initially contains a unit rectangle from (0.0f, 0.0f) to (1.0f, 1.0f). The desired subrectangle should be written to textureSubRect by this function. This can be used in conjunction with computeDestTextureSize() to select a subrectangle of the source texture for rendering. The default implementation leaves textureSubRect unmodified. 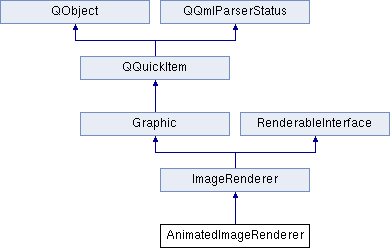 Synchronize this Graphic for rendering, adding any RenderNodes to renderList, and buffering any data that will be needed on the render thread for rendering. Index of the current frame, zero being the first frame. Seek position into the animation, with 0.0f being the start, and 1.0f being the end. Total number of frames in the texture sheet. Delay between frames, in seconds. Loop this animation, restarting it at the first frame after the last frame has finished displaying. Pause this animation at the current frame. Don't animate when this image is off screen or visible is false. This reduces the amount of CPU used, but means it isn't completely in step with game time. Animate this image at the speed of the game, pausing when the game is paused.